This quiet apartment (on the ground floor) is part of a larger complex of 5 rustically decorated apartments. You can have your breakfast at the picnic tables in the garden. And what a beautiful view you have from this spot! Take a dip in the fully enclosed pool. The shared barbecue makes it easy to quickly organize a culinary evening! For lovers of horseback riding, it's possible to take a (paid) tour starting from the holiday home through the surrounding nature reserve. Take advantage of the owner's vast knowledge of the area (in English). 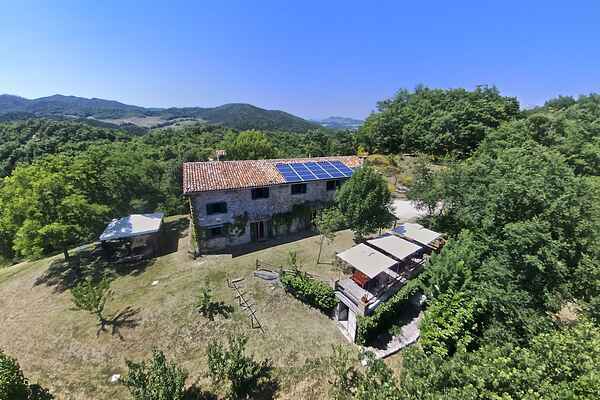 You are in the middle of a woodland area of ​​38 hectares, which borders a nature reserve with abundant wildlife. Beautiful walks start from the front door of the house. For groceries, a post office, bank and several restaurants you can visit Padule (8 km). You are only 10 km from Gubbio, not to mention its Piazza della Signoria, a balcony-like plaza that is labeled as one of the most beautiful in Italy. Of course there are many more outings possible such as to Perugia (35 km). How to reach the property Once you are in Gubbio, drive along the SS219 road following the indication for Padule; opposite to the curch of Padule, turn into Via San Bartolo and proceed for around 8 kilometres following the indication for "Il Palazzetto".